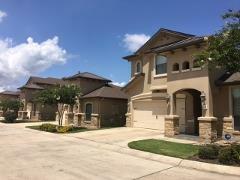 Current (Active) MLS listings of homes for sale in Bella Vita appear below. 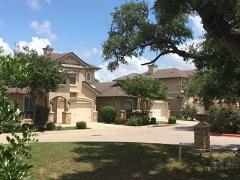 Call Jim at 512.913.1557 for info or for a showing. Neighborhood Location: Take Exit 221 off IH-35, then turn right onto Main Street. Continue on Main St., which merges with S Loop 4/FM-967, through Downtown Buda. Belle Vita is located past the railroad track and W. Goforth Rd. on the left. The entrance is at Bella Vita Pkwy. A look at several years of real estate data for home sales in Bella Vita follows below. Bella Vita Buda real estate market data from the Austin Board of Realtors, 1/1/2010 - 12/31/2018. The Bella Vita Garden Homes (& 2 Townhomes) were built by Callidora Homes. The developer is GMA Property Development. The construction process of new homes in Bella Vita began in 2008, and was completed in May 2017. Bella Vita is primarily a development with around 34 freestanding garden homes. It also has two, 2-story attached duplex-type townhomes. The garden homes are either single- or two-story residences. There are a total of 36 single-family residences in Bella Vita. Built with a Tuscan/Mediterranean flair, Bella Vita homes provide modern convenience and features, and with green-building designs & 5-star energy-efficient ratings. Homes in Bella Vita, per MLS records, range in size from 1,466 sq. ft. to the largest at 2,380 sq. ft. They are feature-packed, including the choice of 1- or 2-story living, a garden home (stand-alone) or a townhome (attached 2-story), SS appliances, granite countertops, tankless water heaters, low-flow faucets, and much more! Some 2-story homes have master bedrooms down. The entire neighborhood is designed to provide "lock-and-leave" convenience for those who wish to downsize or do not wish to mow a yard any longer. Yard maintenance is included in the $50/month HOA fee that residents pay. 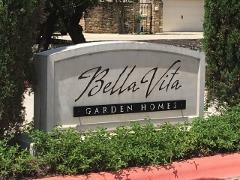 Bella Vita Garden & Town Homes: Travel, Shopping, Recreation, Etc. These garden homes and townhomes are located close to Downtown Buda with its many quaint shops, businesses, parks and eateries. Just exit the neighborhood, turn right, and make a short drive. Bella Vita is also within walking distance of these places for many. Other key places are located past Downtown Buda toward IH-35 on Main St. These include the US Post Office, WalMart, HEB grocery store, Logan's Road House, Cracker Barrel, Chili's and Cabela's outdoors store. Beyond that in South Austin, check out the Southpark Meadows development at IH-35 and W. Slaughter Ln. S Loop 4 (aka FM-967) can also be taken to IH-35 to locate the many shopping/eating establishments south of Buda in Kyle (Home Depot, EVO Entertainment, WalMart, Target, Lowes and a host of others) and in San Marcos (Tanger Outlets, Premium Outlets). Try the Plum Creek Golf Club (in Kyle), and the Grey Rock Golf Club (owned by the City of Austin, located in Circle C Ranch) if you are interested in golfing. There are many nearby park and outdoor facilities, including the City of Buda and City of Kyle parks, the City of Austin Metro and Searight parks along W. Slaughter Lane, Zilker Park, and McKinney Falls State Park. Students who live in Bella Vita attend schools of the Hays Consolidated Independent School District. Prospective buyers of a garden or town home in Bella Vita should confirm the currently assigned schools and other school information with the Hays CISD.